These fluffy, friendly, white dogs make great companions for all family members. 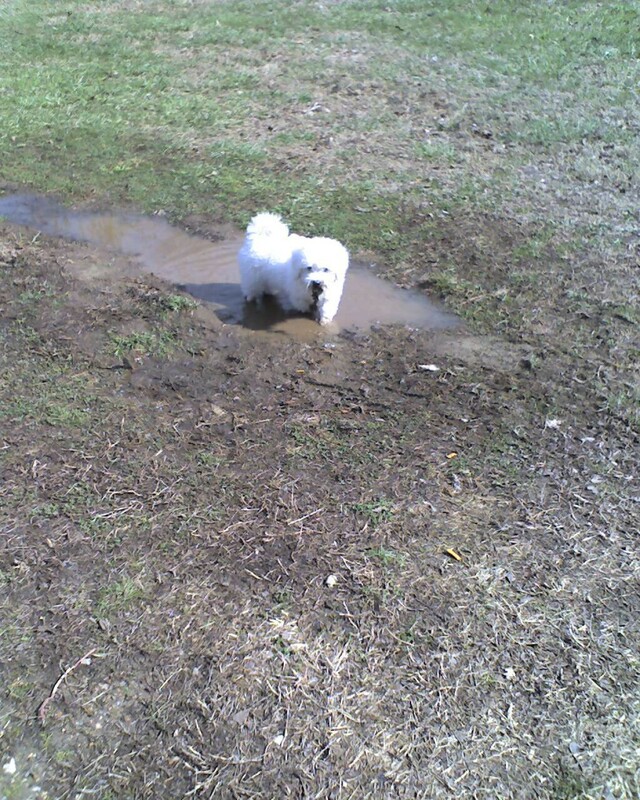 This is a guide about Bichon Frise breed information and photos. 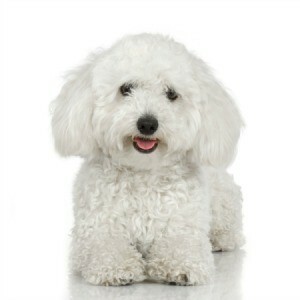 Breed Description: The Bichon Frise is a small, sturdy dog with a fluffy white coat who loves to be the center of attention. This breed is known for its friendly nature and physical agility. This breed makes a good companion for the elderly, small children, and other family pets. Color(s): Usually pure white, this breed may also have shadings of buff, cream or apricot around the ears and on the body. 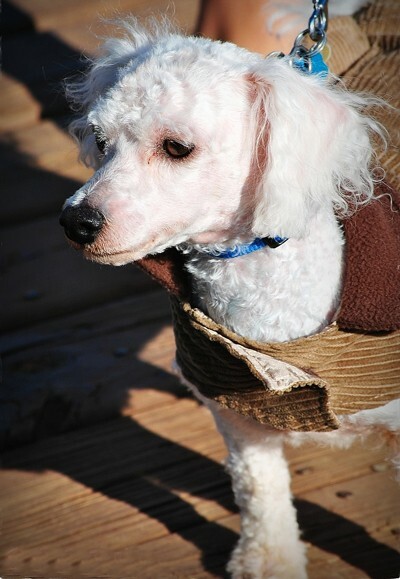 Coat Type: The Bichon Frise has a fluffy double coat that consists of a soft and dense undercoat and an outercoat that consists of coarser, loosely curled hair. 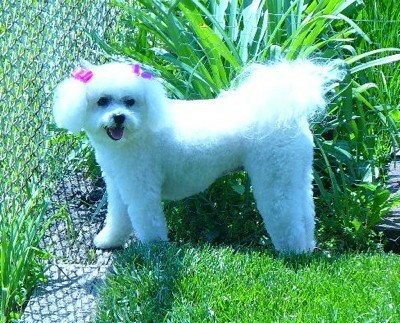 Grooming: The coat of the Bichon Frise requires frequent (daily) grooming to prevent it from matting. They have a non-shedding coat suitable for people with allergies. This breed requires standard care for ears, pads and nails, but special attention should be paid to runny eyes due to recurring tear duct obstructions. Exercise Needs: This breed is active and lively, but suitable for apartments and the elderly if give adequate exercise. Temperament: Sensitive and gentle, this breed is known for its cheerful and affectionate nature. 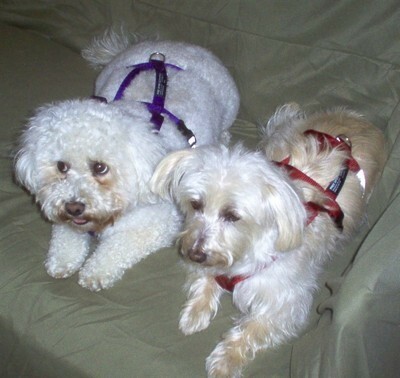 The Bichon Frise gets along well with other companion animals and with children. They are outgoing little dogs that prefer to spend time with members of their family. Although they are not good guard dogs, they are good watch dogs that will bark to announce strangers. 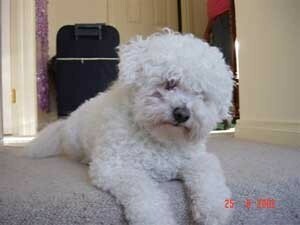 Common Ailments: The Bichon Frise is susceptible to eye, skin and ear problems, epilepsy and dislocated kneecaps. Trivia: The Bichon Frise was also highly regarded in Spain and was frequently used as an item of barter internationally throughout antiquity. This breed is featured in many paintings by the famous Spanish artist Francisco de Goya. 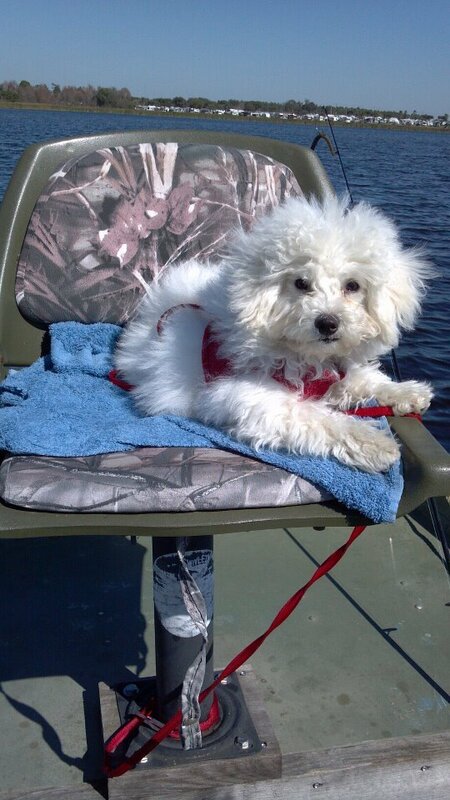 More Information: Bichon Frise Club of America, Inc.
Earlie is a six year old Bichon Frise who loves the Canadian winters. I got Earlie in October of 2003. Earlie is mostly spoiled, but for a small creature, she does honestly love to roll in the snow. When the spring arrives. it's off fishing with me in my small boat. What more can one ask? A true friend and companion indeed. Earlie is an extension of our family who does have her place. A gift and then some. 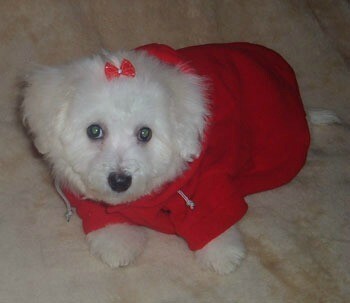 This is Sophie a Bichon Frise. I am note sure how old she is but my best guess is that she is 4 years old. Sophie has been with us for 7 months. She was rescued by Small Paws after a back yard breeder turned her into a shelter. She is gradually coming out of her shell, loves to buzz around the house in a mad dash, grinning her toothless grin. She happens to be missing 8 teeth and we call her the toothless wonder. She responds to our asking if she is a happy dog with a tail wag that instead of back and forth goes in a circle like a propeller. 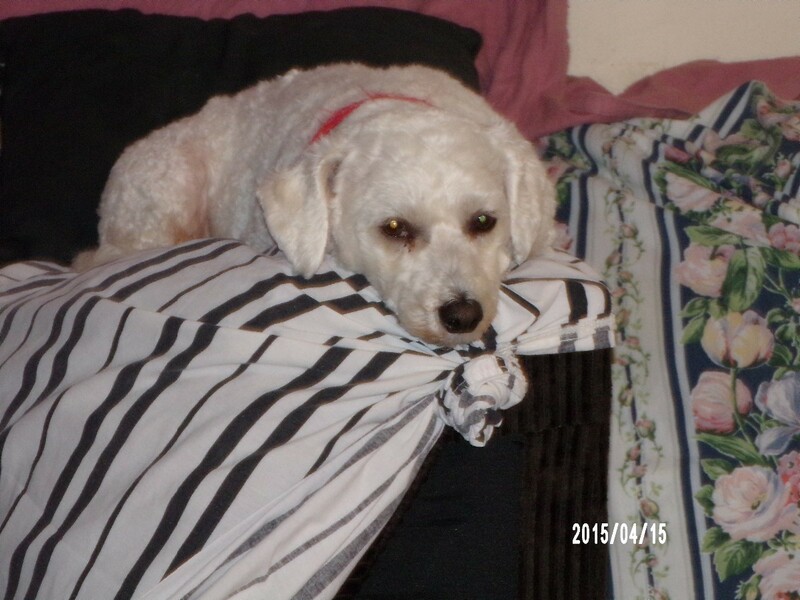 Lucky is 3.5 years old and a Bichon Frise. Our neighbors gave him to us when our cat died, he was a great comfort to our son. He loves to chase after stuffed animals and swim at the doggy park's pond. Loves crowds of kids and noise, likes to be in the thick of it and to be included in kids' games, he's a kid magnet as he is very sweet and everyone wants to pet him. He is a cuddle-bug, he loves to be petted and will lay on his back if he sees anyone approaching, loves to sleep too! If it is past 9pm and he is on his bed already, he passes out on the floor and sleeps soundly. She was 8 weeks old when I got her. She loves dressing up. This is her Halloween outfit. Fuzzbutt is a 3 year old Bichon. I bought Fuzz from a friend. He just loves to get dirty! Nooch is estimated at 5 years old. He is a Bichon Frise who thinks he is a cat. I rescued him from a Non-profit. He loves his sqeek-ums and trying to be a cat. Max is a 2-3 year old Bichon Frise that I adopted from the Humane Society of Rome, NY on September 1, 2009. Max likes to run around the house. 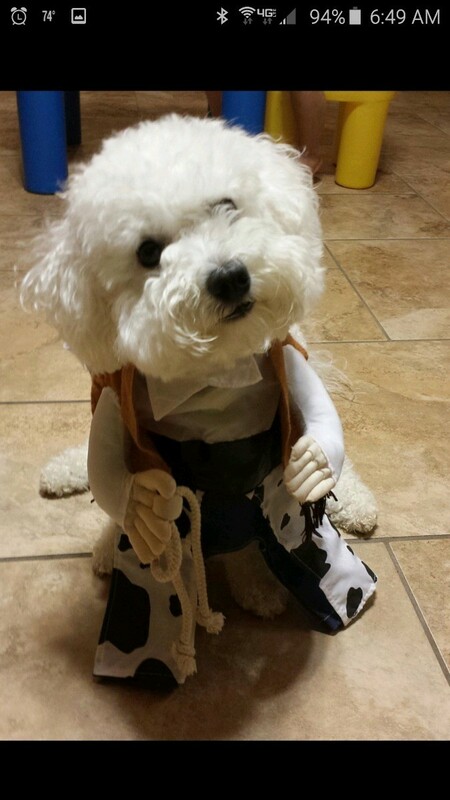 He is the sweetest Bichon you'll ever meet! He loves to be held, and can't wait to greet you at the door when you come home! 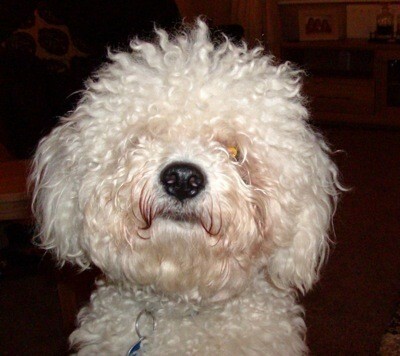 Toby is 2 years old and is a registered Bichon Frise. I bought him from a breeder when he was 8 weeks old. Car travel is an important part of Sassy (8 yrs) and Daisy's (13 yrs) lives. They are dressed in their safety harnesses that hook to the car seat belts, and seem to be saying, "so is it that time yet?" Sugar will be 4 years old on March 7, 2010. 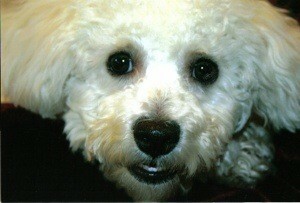 She is a Bichon Frise, but is often mistaken for a poodle. I bought her when she was 8 weeks old from a lady whose dog had pups. Cooper is 9 weeks old in this picture. 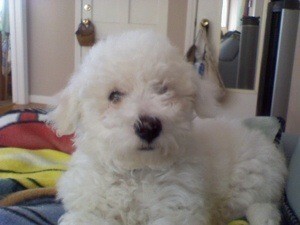 He's a Bichon Frise that I got in the summer of 2008. Cooper loves to hop. He really does. You would swear he had some bunny in him. This is Zoey. She was my Christmas gift from my boyfriend. She's 14 weeks old and loves running through the house and up & down the stairs. We love her and enjoy having her around. She's adorable! 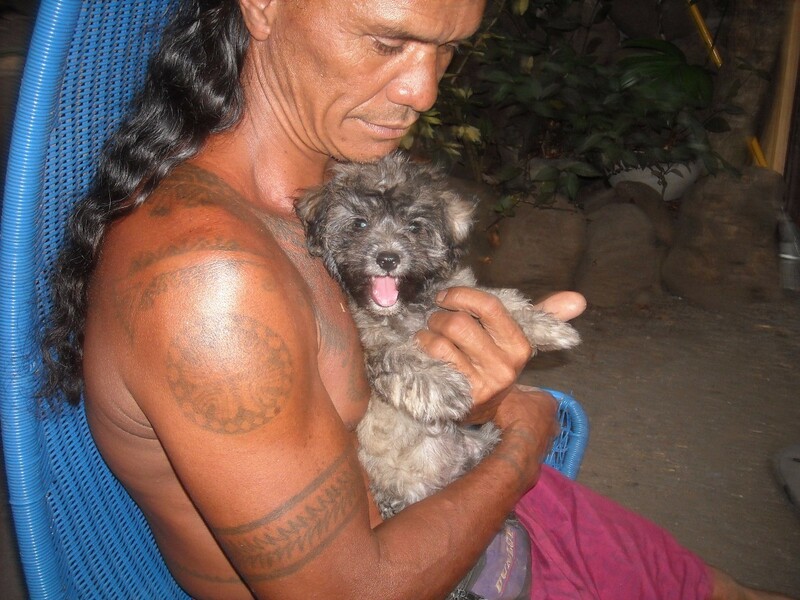 My girlfriend here in Tahiti raises Bichons. When her black Bichon Frise gave birth to 6 puppies she offered me one. Cheyanne came to live with me in December of last year. 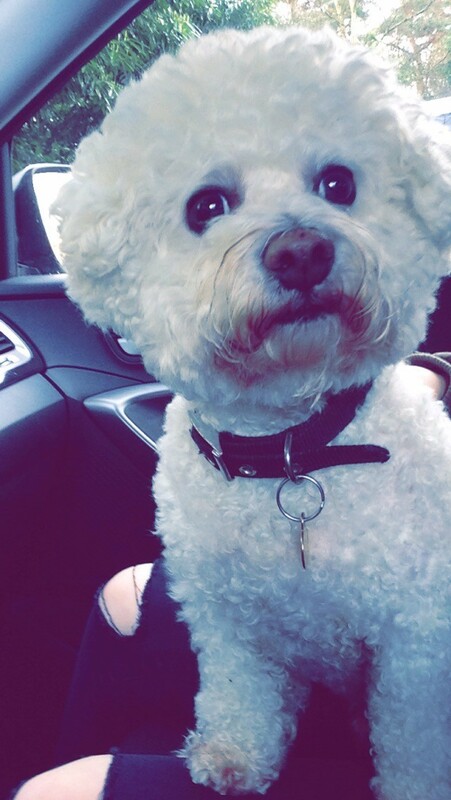 Toby is a Bichon Frise and is 4 years old. Toby was bought by another family, but he worried their old pet Labrador who hid under a bed for two days. He likes to annoy the cat. He's a loveable imp who can't keep clean. 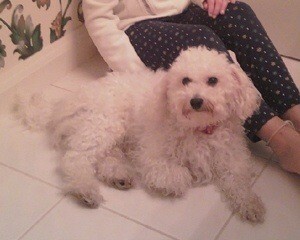 Sophia is my 10 month old Bichon Frise. I bought my Sophia when she was 8 weeks old. She loves boating. She loves, loves, going out on the boat. I got Jake when he was 6 months old. We found him in the newspaper. He likes to go out for walks and play with his dog friends! Benny is my boyfriend's dog. He has had Benny for 5 or 6 yrs now. Benny was about a year old when John got him. He was being rehomed and John's daughter thought he would be a great companion for her dad.